The Vileda Iris metallic bin range is designed for indoor use within heavy traffic areas. The bin utilises "combined materials" technology to give the durability and performance of plastic, being easy to clean, fingerprint, rust and dent proof, with the aesthetics and image of stainless steel. 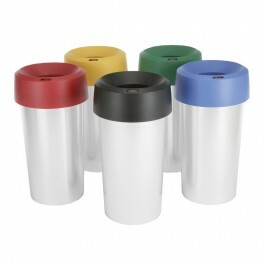 Durable plastic contruction with metallic finish. Rust, dent and fingerprint proof. Washable and easy to clean. Integrated handle for easy carrying and lifting. Integrated bag holder ensures the correct fit of your waste bag. Anti-slip rubber feet avoids movement in use and protects flooring. Available in blue, black, green, red and yellow.